It’s because of you that this mission station is thriving and well. As you’ve read, we’ve suffered many unforeseen setbacks this year, but your support and prayers have seen us through them, as we continue to provide the finest, most professional and caring service possible to individuals and families throughout 100,000 square miles. Your gifts keep education, Catholic inspiration and liturgy, vital information and positive companionship alive in this most remote and challenging region. Thank you so very, very much for your faith in us and your generous help. You are constantly in our prayers. PRESERVING HISTORY: (left) Public affairs director Amy Flaherty interviews Ora Gologergen (guh-LOGG-er-guhn) in her home in Savoonga. The village of 700 sits on rugged St. Lawrence Island, 164 miles southwest of Nome. At 92, Ora is the oldest resident of the island. According to the most recent audience measurement survey, every Savoonga adult is a daily KNOM listener. (Left) The red star notes where Savoonga is located. Please turn to page 2 for more about Amy. RADIO MASS: Little Diomede (pronounced DYE-uh-meed) is a tiny mountainous island in the Bering Strait, only 2-1/2 miles across the International Date Line from Russia. (Left) The red star notes where Little Diomede is located. 135 miles northwest of Nome, Diomede is home to 144 hardy souls who primarily feed their families with what the sea provides. They live a rugged, isolated life, as their ancestors have for generations. Today, the inhabitants are primarily Roman Catholic, but because of the village’s tiny size and its frequently inclement weather, they at best see a priest once or twice a year. But one thing’s for sure. Every Sunday, as they have for many years, worshipers gather in the far-flung island’s church. They turn on a radio and pray along with the Mass we broadcast on KNOM. (Left) an image of the village of Little Diomede, at right, and Russian Big Diomede Island, at left, thanks to then-volunteer Clinton White in 2005. To read more about Little Diomede, see the May 2006 Nome Static, with four photos by then-volunteer Jesse Zink. Thank you, thank you, for making this, and all we do, possible. FAREWELL: We bid a sad farewell to Amy Flaherty (left, on a blustery summer afternoon). If you were to list the top handful of KNOMers over the mission’s 42-year history, Amy would be among those named. 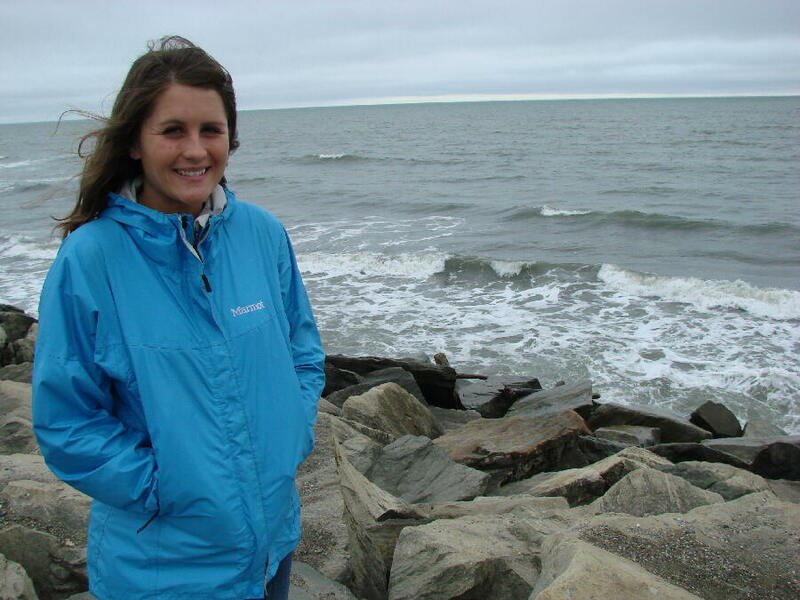 Amy was accepted as a volunteer and flew to Nome shortly after graduating from the College of St. Benedict in 2002. Within a few days, she was announcing the KNOM morning program. She continued to deejay and report occasional news, but Amy’s real talent turned out to be covering remote village events and interviewing people. After two years as a volunteer, the mission hired her as public affairs director. 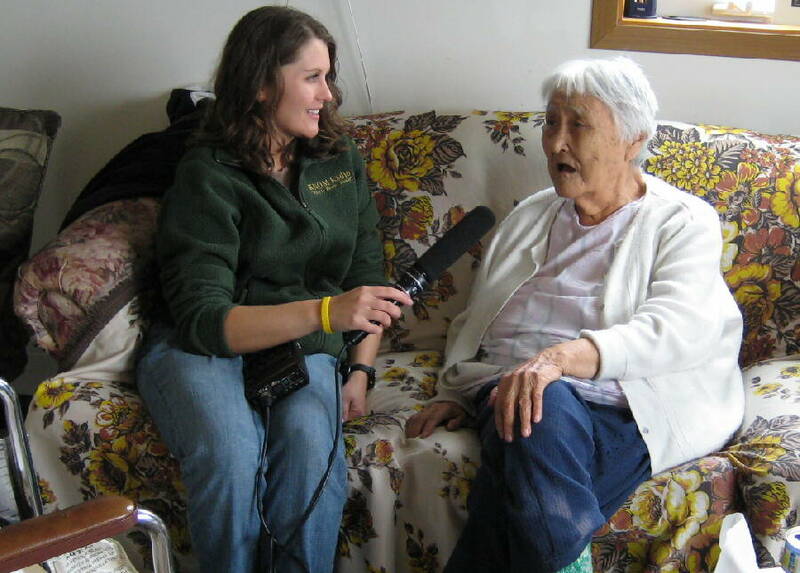 Throughout her KNOM career, she has produced hundreds and hundreds of interesting, educational and valuable programs, in Nome, throughout the state, and at statewide gatherings of Alaska Natives. September 1st, Amy moved to Wasilla, in urban Alaska. We know that you join us in good wishes and prayer for this wonderful young woman. CRITTER NEWS: Early one morning, a Nome police officer thought he was chasing a grizzly bear down the street. After the bear ran out of town and onto the tundra, the officer noted hoof prints in the muddy streets. The bear had been following an adult and a baby moose, which apparently had wandered through the city. VISITORS: Our mission saw several visitors this summer. If you have the opportunity to travel to Nome, we would be delighted to see you! MOTHER NATURE TO THE RESCUE: In August, KNOM reported record runs of pink salmon in the Nome region. Just about everyone was out landing fish to feed their families during the winter. The oldest Catholic radio station in the United States, serving the poor and isolated, thanks to you. SECOND YEAR: KNOM music director Laura Davis (left) has signed up for a second volunteer year. 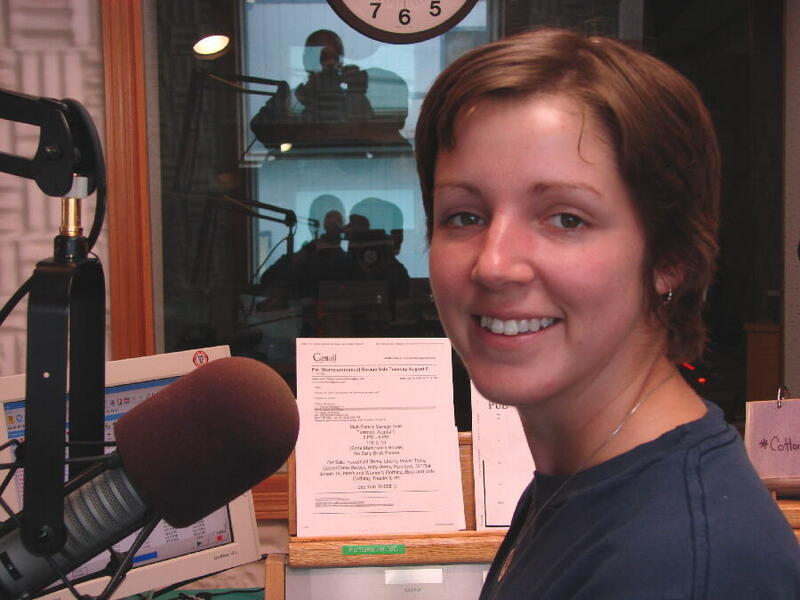 Laura, who hails from Newport News, Virginia, fine tunes the station’s music, produces special programs, and announces the early evening shift. Laura has a bright, engaging quality on the air and we greatly look forward to her second year. Recently, Laura’s mom and sister sent drapes for a window in the volunteer dormitory, the first in its 16-year history. Thank you! “Nome is an anachronism, a step back in time. 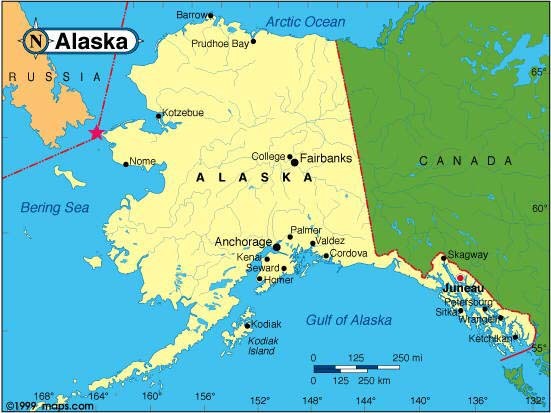 It is a shack town huddled almost apologetically on the shore of the Bering Sea, a short boat ride from Siberia. “It is a decaying monument to the great Alaska gold rush at the turn of the century. It is a tough place to live, and it may be the most different city in America. “I DECIDED TO WRITE,” says a village listener, “to say thank you for the services KNOM has been providing us throughout the years. “I’ve been listening to KNOM for as far back as I can remember, and I will be turning 41 in a few days. From weather forecasts…to news, it’s been a godsend to many of us…. HE DIGS IT: (left) On vacation in northern Israel, KNOM news director Paul Korchin is a volunteer excavator at an archaeological dig. 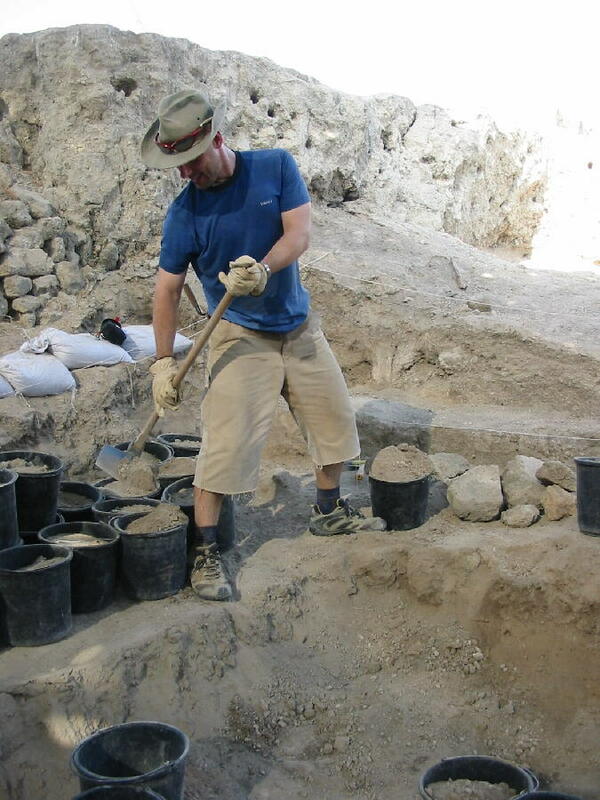 The location is Tel Rehov, where Paul is filling buckets from a stratum of mixed Israelite and Canaanite origins, from the 10th century B.C., about the time of Kings David and Solomon. Near the Sea of Galilee, the city was strategically located along trade routes in biblical times. FORTY YEARS AGO: In September 1968, paperwork for construction of the future Catholic station remains snarled in paperwork in Washington, D.C. Meanwhile, volunteer engineer Paul Deiser keeps himself occupied with minor busy work, puttering around Nome’s Catholic facilities. THIRTY YEARS AGO: Thanks to a spectacular crop of wild tundra blueberries in 1978, KNOM secretary/cook Joanne Ambrosi and eleven volunteers bake no fewer than 60 blueberry pies. Most are frozen for later, and with 20 people at the dinner table, the rest disappear quickly. IT’S IN THE MAIL: We apologize if it’s taking longer than usual for us to reply to you. Until late August, when we saw a bit of a clearing, Nome’s summer was mostly foggy, drizzly and windy with low visibilities. Dozens and dozens of flights overheaded, and mail backed up in Anchorage. There were several periods, one for almost a week, when no flights landed. Further, the Nome Post Office is enduring extremely short staffing right now, and it’s taking longer for mail to be distributed. We are grateful for your patience! SEEING SPOTS: Educational spots on KNOM this past month included: Access to college, phobias, inhalant abuse, bullying, Alaska Native traditions, subsistence, autism, healthier babies, medication errors, hygiene, countries of the world, child abuse, pollution, astronomy, antidepressants, vision, emotional health and foster care, among many, many others, about 2,800 spots every month. Thank you once more for providing this, and the many other services KNOM offers to the most remote people of the United States. From our homes to yours, may the Peace of Our Lord be with you always. God bless you greatly!